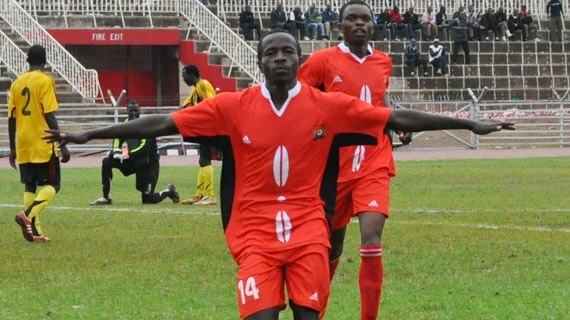 Moses Arita will not go back to his club Tirana in Albania, michezoafrika.com can reliably report.Arita, a sensational upcoming Kenyan striker signed a three year deal with the Albanian side on a mutual agreement between his club Thika United and Tirana. However things seem not to have flown smoothly for the teenager as a few months after his signing, he was back in Kenya due to VISA complications alongside his team mate James Situma. The Kenyan duo of Situma and Arita are both still in the country since the VISA processing has taken longer than expected. The Albanian club was also recently acquired by new owners who have made sweeping changes in the team thus making matters even more complicated. According to Arita, he has made up his mind not to go back to Tirana and he is keen to return back home to play for a local club next season as he ponders on his next move. He is however yet to decide which club he will join for next season. “It is a bitter decision but that is what I have decided, the issue has taken long to resolve and there is no clear picture of what is happening on the other side. Personally I feel I need to keep playing more because am still young and I have a long future ahead, the more I keep staying out of competitive soccer, the more I get rusty.” He said. Compared to what he was getting while at Thika United, Arita was to cash in a good amount of money during his three year tenure at Tirana but the young lad says. “At this stage am less concerned about money, am more concerned about developing my career and sharpening myself for a better future. This was a very good opportunity for me to start my professional career outside Kenya in Europe but I cannot force it. It is like a new born baby, the expectant mother was so eager to see it but when it is a still birth or the baby dies immediately after birth, you have to mourn, but move on and hope God will open another door for you to get better ones in future.” He added. By the time he left for Tirana , Arita was leading the Kenyan premier league top scorer’s chat with ten goals.